Eritrea is located in the strategic area of the Horn of Africa. It is bordered by the Sudan to the North and West, Ethiopia to the South, Djibouti to the South East and the Red Sea to the East. It has a land area of 124,320 Sq Km, including some 390 islands, and a population of about 3.5 million. Asmara is the largest and capital city. Eritrea shares more than 1,000 km coast along the Red Sea stretching from Ras Kasar to the Strait of Bab el Mandeb. The main ports are Massawa and Assab. Eritrea has nine nationalities, each with its own language and cultural heritage: these are Tigrigna, Tigre, Saho, Afar, Bilen, Kunama, Nara, Hidareb, and Rashaida. Eritrea has an agrarian economy with about 65 % of the people living in rural areas. On the basis of broad similarities of moisture and temperature, natural vegetation cover, soils and land use, Eritrea is divided into six agro-ecological zones. They are the Moist Highland Zone, Arid Highland Zone, Moist Lowland Zone, Arid Lowland Zone, Sub-humid Escarpment Zone and Semi-desert Zone. The altitude ranges from 110 meters below sea level in the Danakil Depression to 3013 meters above sea level at the Mount Soira, in the Highlands. The main rivers (seasonal) that flow westward include the Barka and Gash (Mereb). It has diverse climate ranging from hot arid, adjacent to the Red Sea to temperate sub-humid in isolated micro-catchments within the eastern escarpment of the Highlands. Annual rainfall ranges from less than 200 mm in the Eastern Lowlands, 450-600 mm in the Highlands, and 600-800 mm in the southern part of the Western Lowland to about 1,000 mm in a small pocket of the Eastern Escarpment. Mean temperature varies between agro-ecological zones, ranging from 18°C in the highlands to 35°C in the lowlands. From the beginning of the 16th century, Eritrea had fallen under the control or influence of different external powers, first the Ottoman Turks (1557-1865), followed by the Egyptians; and from the end of the 19th century (1890) it was consecutively ruled by Italy, Great Britain and Ethiopia. During the Second World War, Italy was defeated by the British forces and Eritrea became a British protectorate (1941-52). In 1952, Eritrea was forcibly federated with Ethiopia by a United Nations resolution NO. 390/A. The federal relation with Ethiopia was systematically abrogated by the Ethiopian Emperor, Haileslasie 1. As a result, the Eritrean people were forced to wage an armed struggle for liberation in 1961 that culminated in the liberation of the country on May 24, 1991. In 1993, Eritrea got its formal independence through the United Nations sponsored referendum in which 99.8% of the people voted for independence. From 1991-1997 Eritrea and Ethiopia developed a cordial relationship. Nevertheless, this peaceful development of these two neighbouring countries was disrupted with the start of the ‘Border War’ (1998-2000). In 2000, both countries agreed to settle their ‘border issue’ through arbitration. The Eritrea- Ethiopia Boundary Commission (EEBC) gave a final and binding ruling on the Boundary in April 2002. In July 2018, the two governments agreed to implement the decision and normalize their relations and as a result a new chapter of peace, friendship and cooperation has been heralded as a breakthrough. Eritrea is of a presidential state, with a president elected by the National Assembly. The Government is composed of three bodies: the Legislative, Executive and Judiciary. In the Executive branch, the President nominates posts for the ministries, authorities, commissions and offices. The cabinet of ministers as an executive body is chaired by the president. Eritrea is divided into six administrative regions, each with its own regional governor. These administrative regions are Anseba, Debub, Debubawi Keih Bahri, Gash-Barka, Maekel and Semienawi Keih Bahri. It has 57 sub-regions, 699 administrative areas embracing 2,564 villages, towns and cities. Each sub-region, administrative area and village has its own administrator; the last two are elected by eligible residents. The Eritrean Cadastre system was established at the end of the 19th C during the Italian colonial administration. The main purpose was to guarantee security of property ownership for Italian settlers. The Notary Public that authenticates contract agreement and secure transfer of property transactions was also established during this period. The registration system was carried out on voluntary basis. It was confined mainly to urban areas and some lands allotted to Italian settlers on concession basis for commercial agriculture. The registered property had simple survey plan, land records related to ownership, area and plot number. It kept records with utmost care. But, the registration system remained voluntary and sporadic, unable to support proper land management. The cadastral system was organized within the High Courts for more than a century, until it was reorganized into the Ministry of Land, Water and Environment (MLWE) in August 1999. The Registration Law, NO. 95/1997 transformed the voluntary nature of registration into mandatory one. According to the Registration Law (NO. 95/1997), the Cadastral Office registers all land and other immovable property erected over land. The Department of Land of the MLWE surveys land, records land parcels and allots to individuals and legal persons. Cadastral surveying as a “process of creating, measuring, and marking boundaries on the ground”, defines and demarcates land parcels’ physical boundaries. The Cadastral Office formally registers land after it has been allotted by the Department of Land and buildings are registered upon the issuance of certificate of building by the Departments of Infrastructure. Organizations that are responsible for cadastral surveying include the Mapping and Information Centre, Department of Urban Planning of the Ministry of Public Works, Department of Land, etc. The Regional Departments of Infrastructures are responsible for planning and providing certificate of buildings constructed according to plan. Prior to some18 years ago, private individual surveyors were involved in cadastral surveying. At present, there is neither private sector involvement in land registration nor in cadastral surveying. But the need for private surveyors’ involvement in surveying activities looks indispensable. Currently, outside the government institutions, there is no professional organization or association related to cadastral surveying or mapping. There is no specified licensing qualification requirement for cadastral surveying professionals as there is no private sector involvement. The Department of Civil Engineering in the Eritrean Institute of Technology (EIT) provides degree (BA/BSc) in Civil Engineering and diploma courses in surveying and drafting. In addition, other vocational schools, such as the Asmara Technical School, and other technical schools such as Don-Bosco (Deqemhare), Winna (Nakfa), Mai-Habar, and the National Vocational Training Centre at Sawa, provide drafting and surveying courses at certificate levels. Annual graduates include 63 in Bachelor’s degree, 49 in Diploma and 315 in Certificate. The Eritrean cadastral system was established during the Italian colonial administration with the purpose of securing property ownership for Italian settlers. The cadastral system registers land (with focus on commercial agriculture) and buildings with the purpose of establishing security of land use rights and ownership of other immovable property through publicity and legal protection. In addition to the security of right or ownership, it is used in the transfer of land use rights and transfers of other immovable property erected over land, provide information and statistical data, support in planning, guarantee for mortgaging of immovable property other than land for credit from banks, register of land use and development. A cadastral system for the registration of land and other immovable property erected over land exists. There is still sporadic registration with focus on urban housing. The cadastral system registers buildings that are built according to plan and have building license; informal or illegal settlements are outside the formal registration system. As in many developing countries, registration of informal settlement remains to be a big challenge. However, registration of houses built on land purchased from right-holders (as land is state-owned land sale is illegal) without prior plan and permit has started after due processing by a special committee. The Cadastral Office provides ‘Temporary Certificate’ with the intention of formalizing them later to permanent certificate when building certificate is given. Cadastre is a parcel-based and up-to-date land information system containing records on land. It has a unique parcel identifier, includes geometric and textual data, and title registration of land use right or ownership of other immovable property. This cadastral concept is manifested by the Cadastral Office’s mission, ‘to protect and guarantee security of immovable property ownership and use-rights over land’. The main mission of the Department of Land is ‘to ensure the implementation of sustainable land management and guarantee optimum use and fair distribution of land’. Thus, urban, semi-urban, and rural lands for housing, farming (be it for usufruct rights or commercial agriculture), enclosures, social services and other purposes are surveyed currently on demand basis, and divided into plots and parcels for allotment and reserve purposes by the Department of Land. Cadastral surveying defines land parcels by giving Id number and demarcates boundaries and sub-divisions. The cadastral Office registers all rights over land and duties that emanate from such rights, other immovable property erected over land, provides information of rights - ownership, usufruct and lease and related processes. A building is qualified for registration upon fulfillment of land lease contract, construction permit, approved plan and building license given by the technical offices. A land lease for commercial agriculture and other social services is registered upon fulfillment of certificate of lease contract and proper survey plan. The cadastral system is parcel-based and composed of a textual and spatial data. The cadastral components include land survey that provides parcel identification and demarcates boundaries and sub-divisions, land and building register with their related processes of right/ownership transfer, register for title ownership or right and encumbrances. Computerization and development of modern database has already been put in place replacing the simple manual database that was in use. Data contained in the cadastre include survey plan showing property identifier, property address, location, land use, land and building area, building date and type, building purpose and license, boundaries, etc. ; proprietorship data such as owners/right holders name, address, id number, spouse name, date of purchase, vendor’s name and address, etc; and encumbrances such as mortgage and pledge and their release, etc. A cadastral map is a map which provides detailed information about real property and the boundaries of all the parcels or lots within a specific area. In general, it shows the cadastral lots and other details of the cadastral surveys, which are surveys made of extensive areas covering an entire municipality (city) or part or extension of city or village (part of it) consisting of several or many parcels of land undertaken for the purpose of title clearance and land registration. Our cadastral map specifically reflects the ‘Area Development Plan’ that provides the location of parcels, vehicular and pedestrian access, parking, open space and other activities or facilities within the area. At this time, our main aim is just to give PID (parcel identification number) and register the use of the parcel of the land. But in the near future, we are preparing Data Base for Land information system (LIS) to link land to users. Our maps have all the map elements such as content (Series name: Name of the area, locality, and state), map scale (Shown both graphically and as a representative fraction), sheet name (including number, edition), map index, north arrow, contour interval (if it is given with the Cad file), horizontal datum, legend, date of publication, copyright, title, name of Surveyor/Company, and border; and the map projection we use is the one, which is most recently developed and widely used datum, WGS 1984. Though we haven’t standardized our map scale, they are drawn on larger scales (ranging from 1:500 up to 1:3000). We simply use the scale of the map just to fit the map frame and should be printed in A0 paper only. Our cadastral map should at most have clarity, order, balance, contrast, unity and harmony in order to be readable by all the target groups. The data model of the map is vector data model; and is first designed by Auto-Cad and Arc-Info and further processed and finalized by Arc-GIS. a) The cadastral map of Eden in Zoba Anseba, Sub Zoba Elaber’ed: It is a small town and this cadastral map is an extension to it. Its target is to integrate the dispersed five villages found in the vicinity of Eden town. a) The cadastral map of Eden in Zoba Anseba, Sub Zoba Elaber’ed: It is a small town and this cadastral map is an extension to it. Its target is to integrate the dispersed five villages found in the vicinity of Eden town (Figure 1). 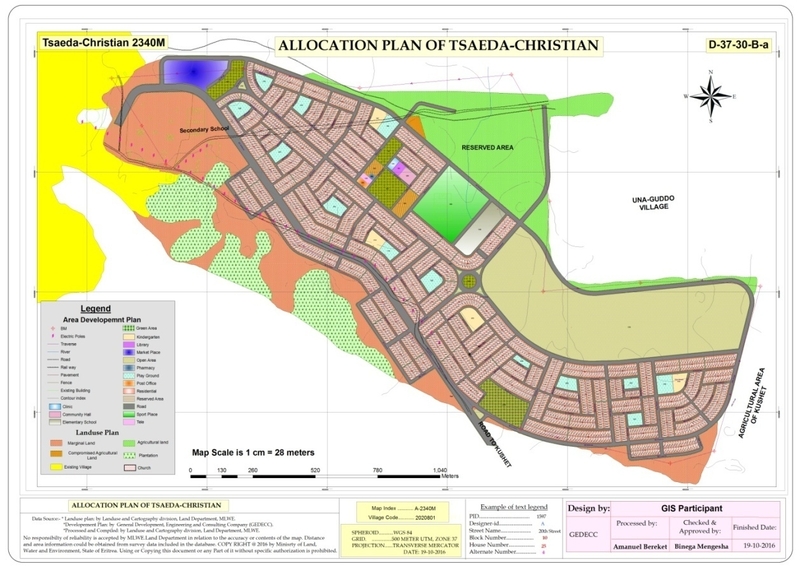 b) The Cadastral Map of Tsaeda-Christian, Sub-Zoba Berik, Zoba Maekel: This is a big village and centre of the Sub-Zoba Berik. This cadastral map is the expansion of it and will solve the settlement problem of the inhabitants in particular and the country in general (Figure 2). Endorsement of social equity (social development and social justice) by securing housing problems. Ensure proper management of the land. Accelerate regional development especially the rural areas. The Eritrean cadastre is still in practice sporadic and incomprehensive. The spatial data is not yet integrated with the textual data. In addition, Notary Public Offices have not been reinstated in all regional seats. As a result, fast and secure transfer of property transactions is not possible and government revenues from property transactions are not collected in time. Moreover, compulsory registration is not enforced according to the Registration Law, due to inadequate institutional capacities. Furthermore, the issue of registration of informal settlements (unplanned houses) remains largely unresolved. The Cadastral Office intends to implement the mandatory Registration Law in order to enable management to have well-informed plans at the central, regional and local levels and ensure proper management of land and its resources. Inadequate human capacities have been a challenge for a long time, but now enhancement of these capacities is underway. Modern database has been developed and is becoming operational (although spatial data is not integrated with textual data), the traditional record keeping system has been transformed into modern record keeping system. In addition, the arbitrary registration service charge fee has been transformed into value-based system. Moreover, a study is being undertaken to digitize old manual records, cadastral materials are translated into one of Eritrea’s national languages to assist the staff, training manuals are being prepared, and cadastral service is being improved to enhance customer satisfaction. Furthermore, pilot project of usufruct land rights has already been completed and allotted to five villages in the Serejeqa Sub-Region of Central Region. However, nation-wide implementation has not been yet initiated. Registration of land purchased illegally from right-holders (as land is state-owned, land sale is illegal) where dwelling houses are built without prior plan and permit has started by providing ‘temporary certificate’. The registration is being processed after clearance from the special committee is established with the purpose of providing ‘permanent certificate’ later when the planning is updated. 1.2 By law, is registration of land ownership compulsory or optional? - Registration of land right is compulsory. But land is state-owned and citizens and legal persons have use-rights over land, be it usufruct, lease and tiesha (for residence in villages) land rights. 1.4 Are the landowners required to register their properties systematically during the initial establishment of the cadastre or is registration sporadic, i.e. triggered only by specific actions (such as for example sale)? Sporadic means unsystematic registration. According to the Registration Law, land is registered before it is allotted. However, in practice, it is recorded in the Department of Land and later in the Cadastral Office after it is being allotted. 2.2 Please estimate the population distribution between urban and rural areas.